Living in a studio apartment in Manhattan can be a constant negotiation between space and stuff, even for the Marie Kondo-inspired minimalist. 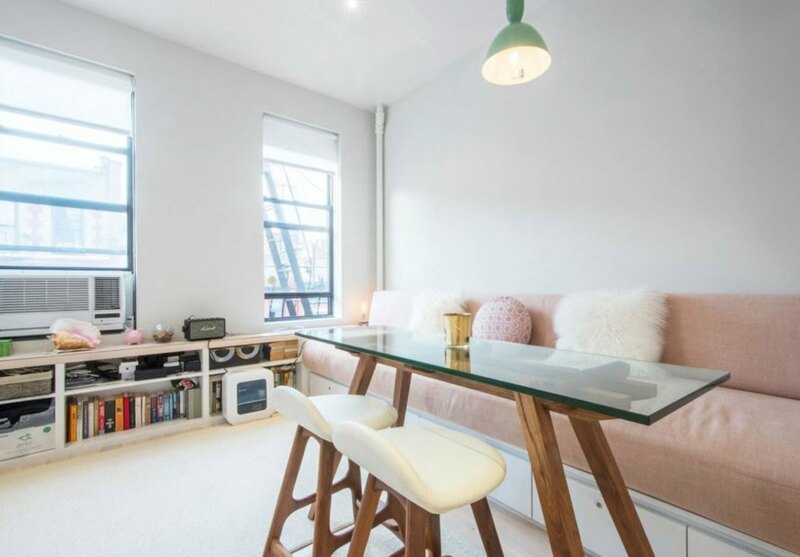 This modestly sized prewar co-op in the heart of SoHo is winning the storage wars with a number of stylish built-ins that only add to its Scandinavian-chic appeal. Read on to take a tip from some of the thoughtful design features that take this small apartment from cozy to cool. Located at 110 Thompson Street, this fifth-floor apartment’s layout maximizes the space’s potential for comfortable urban living. There is ample storage space conveniently built into the kitchen, bathroom and dreamy bedscape area. Fully furnished, the calming, pastel-toned abode features natural wood floors, modern white walls, well-placed drawers and functional accents. The home embodies hygge, the Scandinavian term for cozy contentment that’s been all over the interwebs as of late. While the space is a cool $5,000 per month to rent, those in search of more accessible forms of hygge this winter may want to invest in a pair of cashmere socks, take a walk in the nearby park, or whip up some comfort food with friends instead. Located between Prince and Spring Street, the apartment is in prime Soho. The studio locater in Soho is a mix of pale pinks, modern white walls, and neutral wood. The charming space embodies the Danish term, hygge, or finding contentment in all things cozy. The studio is a mix of pale pinks, modern white walls, and neutral wood. The ample storage space is a distinct feature of the apartment.